Fern Hollow Cabins are located in the heart of the Chugach national forest; ten miles from the upper mouth of the Kenai river and 34 miles from the coastal city of Seward.It offers a convenient location for travelers that want to experience a wildlife cruise or ocean fishing charter in Kenai fjords national park, fishing or rafting the Kenai river, or exploring any of the many lakes and hiking trails nearby. Your host Jan and Judy Odhner have owned this property since 1991.Jan is a professional custom woodworker; . Judy manages their Zudy's cafe in Seward Alaska located on resurrection Bay next to the Alaska Sealife center. Jan has lived in this area since 1980 and Judy since 1990.They love living here and enjoy sharing their mountain setting with travelers. It's proximity to the kenai river,Kenai fjords national park and the many Chugach national park hiking trails. A visit to Alaska Is a memorable experience when staying in a cozy little cabin in mountain country. In the heart of the mountains.Mountains rise over 4000 feet in either direction. This is the heat source and wood is provided. There is a kitchenette with cold running water. Seniors are welcome.Should be in good physical shape. Fern Hollow is for people that are here to enjoy the beauty of alaskas Kenai Peninsula. Beautiful cabin in a great location. Great place to stay and stay in between Seward and Anchorage! Place was great and clean. A fun experience of using a wood burning stove. Beautiful foliage in the backyard and to sit and enjoy campfire. This cabin is no less than AWESOME! 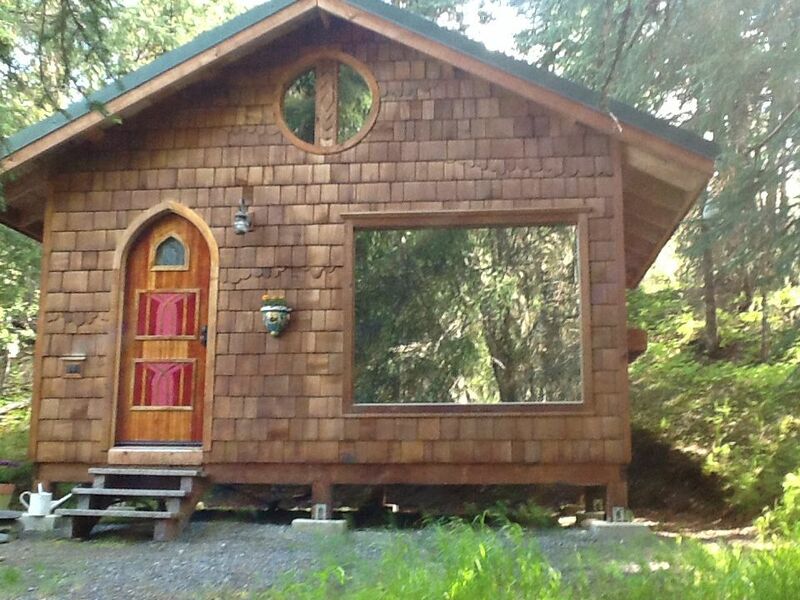 The cabin is nestled in the woods and completely secluded. Close to all kinds of fishing and outdoor sports. It has a path up to the bath house, which in itself, is also AWESOME! Meticulous woodwork throughout both buildings. A fire pit right in front of the cabin for your use. It has a wood stove for heat in the main cabin that gave perfect warm heat. I cannot say enough good things about this place. I would definitely recommend staying here if you are traveling to the Kenai Penninsula. If you make it as far south as Seward...eat breakfast at Zudy's. All the attention to detail, a beautiful space inside and out. Our 4 year old said it was like staying in a gnome house! We had a very peaceful and enjoyable stay at this Moose Pass cabin. The cabin was exactly as described and pictured. We had just finished a 10 day cruise/land tour and we needed some relaxing down time with just the two of us. The cabin is nestled in a lush forest with little artful touches using flowers and decorative items. Jan built the cabin himself which is a work of art in itself. The cabin only has cold running water and you need to walk up a short path to the toilet/shower house which was spotlessly clean (as was the cabin). It was a bit inconvenient not to have the facilities in the cabin, but the positive aspects of the cabin far out weighed the inconvenience. We would rent the cabin again without hesitation. The cabin is very easy to find and it is about a 10 minute drive to Cooper Landing and a 35 minute drive to Stewart. My and hubby stayed here for a couple of nights. It was really nice. It was easy to book with Jan and VRBO. We met the owner once just as we were leaving. Very friendly. Otherwise we met her dogs - very cute. As you walk down the path to the cabin, you are surrounded by trees, ferns, wild flowers and a little creek. Very peaceful setting. There's a fire pit and wood in front with pretty half logs to sit on. It was wet and rainy when we got here. Mosquitoes were around so bring bug spray. You can hear the main road traffic but after a while you forget about it. You can't see it. I thought it might be difficult with the bathhouse in a different place, but it was fine. Easy for me to say since I don't get up during the night to go. Everything was neat as a pin. We brought drinks and they fit in the mini-fridge along with some creamer and snacks. We ended up microwaving our hotdogs as my husband's skill at lighting a fire outside failed. The bed is a small queen - or maybe its because one side is against the wall. Sunset was at 11:30pm and morning at 4:30am and it seemed it was light all the time with the moon out. The little circle window up top isn't tinted so it was a bit difficult to sleep. We found a sleep mask the day we left, which would have helped. We went on a day cruise to see the glaciers in Seward. It was easy to get there from here and its a pretty drive. Highly recommended! We would stay here again without a problem. Rafting or fishing the Kenai river,Boating the many lakes all around.Hiking the Chugach national forest trails all within a short distance.Ocean charter fishing.Ocean wildlife cruise,Zip lining.Glacier climbing.Trout fishing.Big and small game hunting,Ocean and lake kayaking.Horseback riding.